Hello WWM! 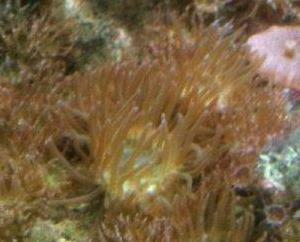 I wonder if you have ever heard of anyone using majano anemones in a refugium as a means of nutrient export, the way some people use Xenia? I'm curious if anyone has tried it and if it has any good potential. Would the majanos stay isolated in the refugium, or can they spit out planulae that can enter the main tank? Thanks for your input on this! I have tried researching but haven't found much info on this particular topic. rock from my wonderful LFS ("You want WHAT???"). They are set up in a species tank as I am interested in studying them. And I am also in the process of setting up a new tank with a refugium so why not try it? Although a majano refugium will certainly be no good for exporting pods to the aquarium, LOL! I have noticed over the past two days that a number of the majanos on my rock have "let go" and drifted to a new location in their aquarium. Something to keep in mind in a refugium - make sure they can't escape! A number of aquarists have written about having one or several majanos in a tank for YEARS without them splitting or moving, so maybe this behavior is in response to either a) being placed in a new environment, and/or b) overcrowding (the rock is COVERED with them). Another thing for me to study! Hi! I purchased some Zoanthids from a friend who was dismantling and were impressed how healthy they had become. 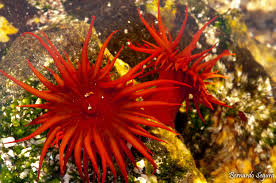 After feeling them I wondered if these are the Majano Anemone. They are confined to their original rock at the moment and don’t appear to be hurting my bubble or Xenia. Should I get them out of there? majano wands safe to use? We had a red bta that we had for over 5 years that died unexpectedly after using the wand. No other casualties-and it does definitely kill the Majanos. Thanks for being a great resource!! As you can see, the distinguishing patterns on the face are identical and both have the bubble tips. Neither have the identifying five or six white lines around the mouth that are common with bubble tip anemones and they don't quite match any of the Majanos I have seen either except for the fewer tentacles and more visible open face. They are very confusing. Are they perhaps a different species than either? Any help you can give would be just brilliant. Thanks so much! First of all, congratulations on an amazing site for information. I have learned a lot from you guys. 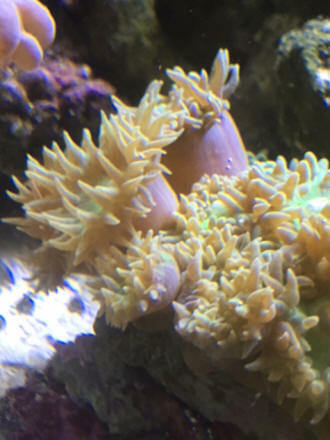 I was wondering if you could help me id this anemone (photos attached). 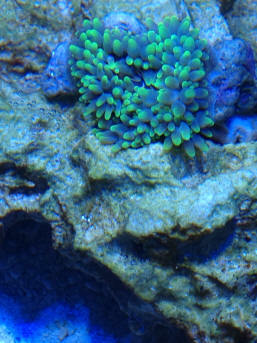 It looks like a bubble tip, but since it has green neon tips, I'm not sure whether it is a rare morph or a Condy anemone. The oral disk has the same color as the tentacles, and the foot has a light brown color. Thank you very much in advance for your time and attention. Thanks for an extremely fast response. It has no markings on the pedicle. It is about 2 inches diameter. I bought it yesterday from a LFS and it hasn't moved since. Two maroon clowns were trying to host it at the LFS. Photo attached for foot visualization. 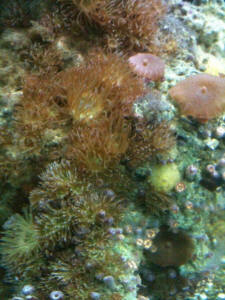 Bob could you tell me the best way to get rid of majano anemones ? I recently purchased this rock and was reading your site to figure out what is on it. 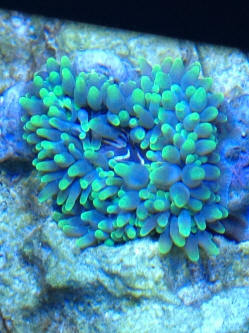 I think I have found it, Majano Anemone? Polyps and Mushrooms? I see the Majano are bad for your aquarium. 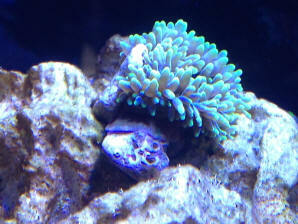 Is there a way to rid the rock of them without killing the polyps and mushrooms? I know three people who also purchased this rock and are wondering the same thing. One suggested boiling water? Or bleach? Lastly, I currently have a 75 gallon and am upgrading to a 150 gallon. (both are drilled) I have 2 Tidepool 2 sumps. Would you recommend using them or a sump made from a 30 gallon long tank? Thank you for your quick response. I did as you said and took the rock out of the tank and put in in a covered Rubbermaid container. Let it sit a few days and when I opened it the majano where coming off and laying on the bottom! If I scrub the rock with a toothbrush it should be okay to use?